We offer a wide selection of garage heaters designed to improve the function and efficiency of your vehicle as well as transform your garage into a practical and useful extension of the living space within your home. Gandy Installations has garage heating solutions for every garage. 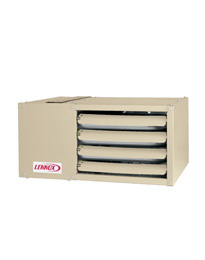 Consider a Lennox Hot Shot heater, with a low-profile ceiling mounted design, or ask us about the unique benefits of infrared garage heaters. Garage heaters are perfectly safe; they are mounted on the ceiling, away from any combustible gases. A heated garage can do wonders for your vehicle by reducing the number of premature failures due to cold starting the engine. You can also save time by not having to wait for your car or truck to warm up, not to mention the cost savings in fuel by not having your vehicle sit needlessly idling when it’s cold out. Garage heaters can do more than just optimize the function and efficiency of your vehicle. Paint, cleaning solutions and chemicals stored in your garage last longer when kept at a stable temperature. A heated garage is also a great place to keep a pet during the winter months, or make use of a workbench when it would normally be too cold to do so. For most families, the garage is the most under-utilized space in the home. In many homes, a cold, seldom-used garage can become a dumping ground, and sometimes even the family vehicle can get crowded out. Installing a garage heater is a simple and inexpensive way to reclaim your garage and transform it into a space the whole family can use. Plus, the appeal of getting into a comfortable, warm car on cold mornings is sure to inspire a certain family member to finally get rid of some “stuff”, thereby clearing up the space needed to park your vehicle back in the garage. Seperated combustion Lennox garage heater!